In honor of Wordless Wednesday! So currently their is a contest going for "Dogs with Carts" these carts also include wagons, and wheelbarrows. 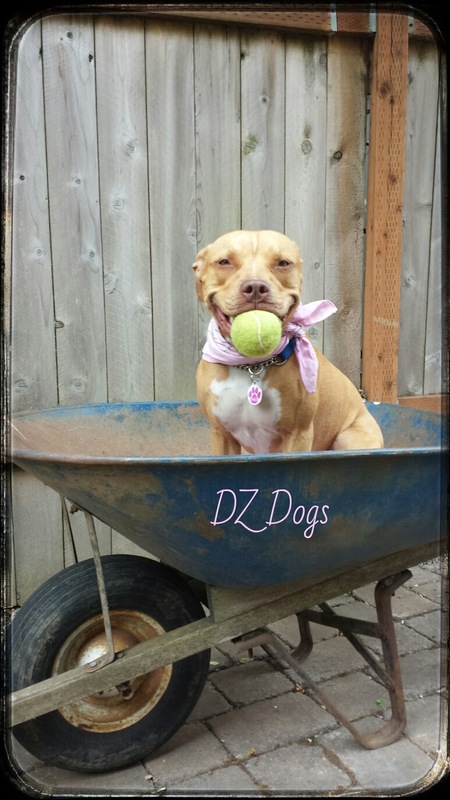 Well I was doing some yard work outside and the thought occurred to me... little miss Ziva would be a super cute contest entry, so in prep I stuck a cozy towel in the bottom of the wheelbarrow grabbed her tennis ball as a reward for good behavior, picked her up and stuck her in! I then handed her the tennis ball and told her to, "wait" while I snapped some pics. Anything for a tennis ball. 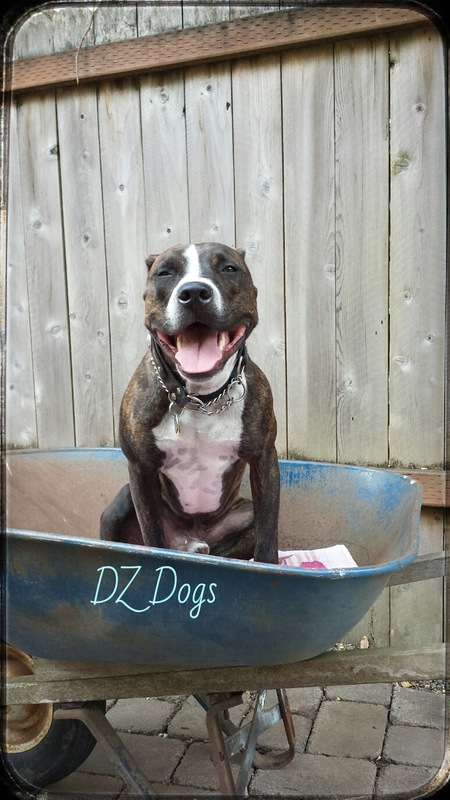 After taking a few pictures I decided it would be fun to get Dante into the wheelbarrow, he's 65+ pounds but I figured with his cooperation (he's such a good sport) it wouldn't be a problem! Well Dante had his own thoughts about the matter, he thought it looked like fun! And since his sister had left the wheelbarrow he decided to get himself in! I reached down to pick him up and he shrugged me off, next thing I know he's got his two front feet in the wheelbarrow and is doing his best to try and pick his back legs up and get in himself! I helped him get in just by picking up his back feet, he promptly turned around in a circle and sat down. We Beaglebratz howled when we saw that furst pikchure of Ziva with the ball in her mouth - she almost lookz like she iz laughin'! 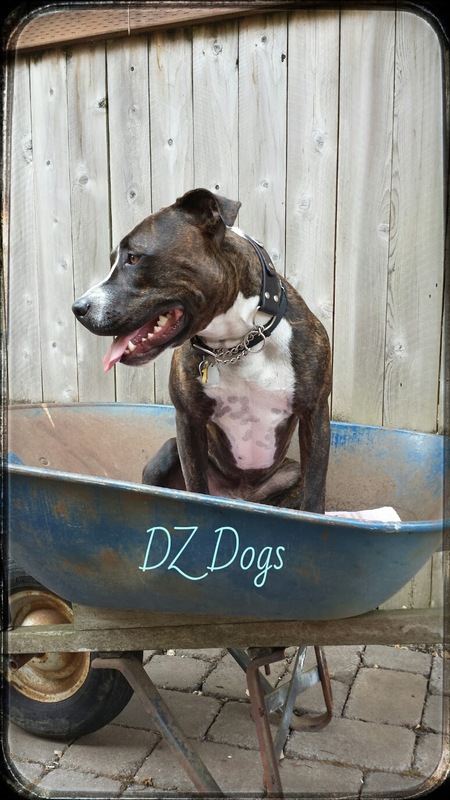 An'what a good boy tue help hiz mom - Dante must haf know u mite hafta struggle tue git him in the wheelbarrow so he d-sided tue help! These photos are so great! Luna and I still have to find a cart we can use. Ziva is such a CUTIE. I love how she's got a smile with the tennis ball in her mouth. It's one of the things I haven't trained Bain to do it yet! I love the brindle coat on Dante. What a muscular boy. Ziva is my smiling baby! All the time. :-) Dante...he smiles too but boy you should see him pout!! It's a look that'll melt your heart every time. Good luck getting Bain in a cart! Haha! Maybe try a wagon? He'd be cute in a kids red flyer. I loved seeing your entries on Instagram! They're completely great and adorable to boot. Adorable beyond words - I love this. 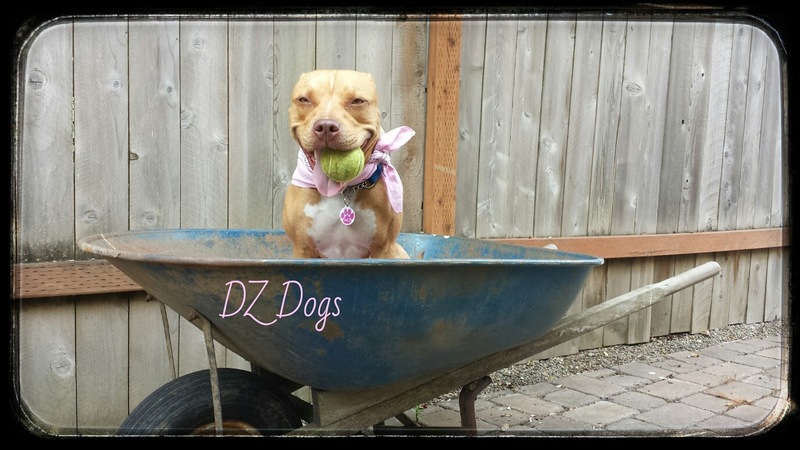 So cute holding the ball and in the wheel barrow - way too cute! OMST!! What a couple of cuties!! They look great! Good luck in the contest. Happy WW!